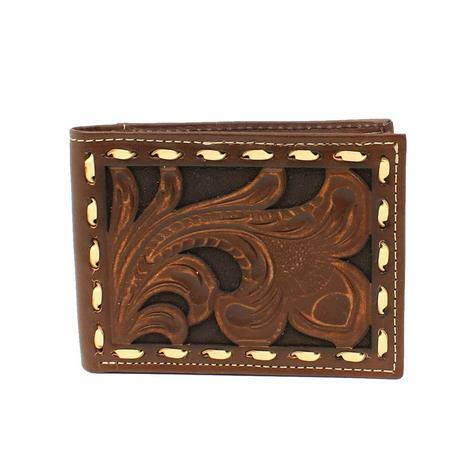 For the love all things western this rodeo wallet is going to one to add to your collection. 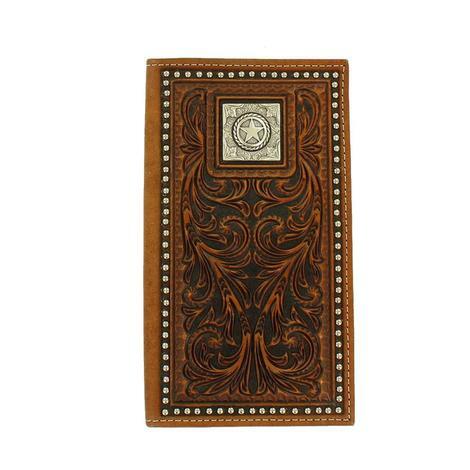 It features a dark brown tooled leather with silver studs and a lone star concho. Made of top grain leather, a slim fit design and a long-lasting quality. 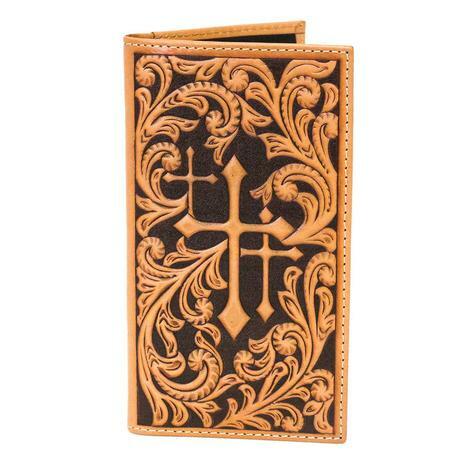 This brown embossed bi-fold wallet featuring a stunning cross in the upper right-hand corner. It is made form 100% leather and is able to be washed by hand only. It has a clear interior ID slot for easy visibility and access and 4 card slots! A great classic look, upgraded! 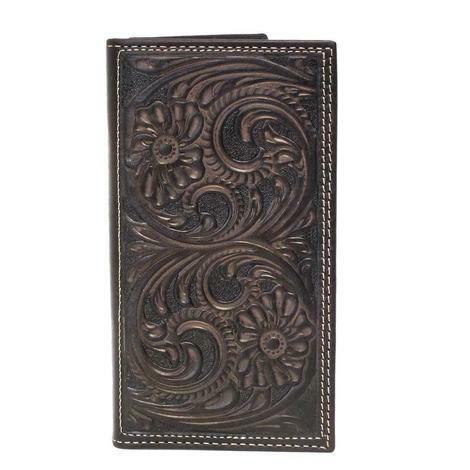 This stunning wallet by Nocona, the perfect way to keep your money close and safe. 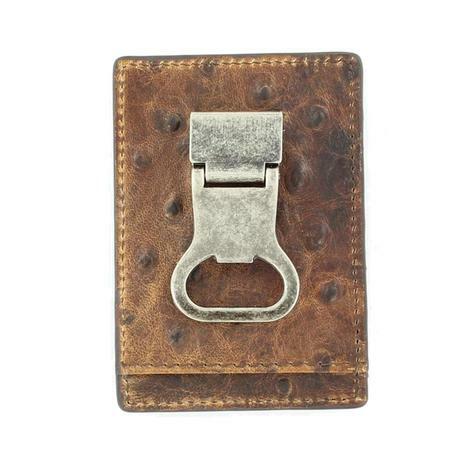 The money clip can also double as a bottle opener, the unique leather design will be sure to be a new favorite! 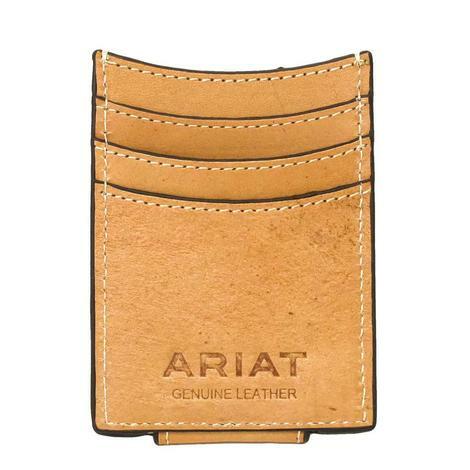 This is a great compact wallet by Ariat measures 3" x 4 3/8" made from top grain leather. It features a outer money clip that will also be used to pop the top on your favorite drink. It has a silver Ariat text and an Ariat Shield logo. 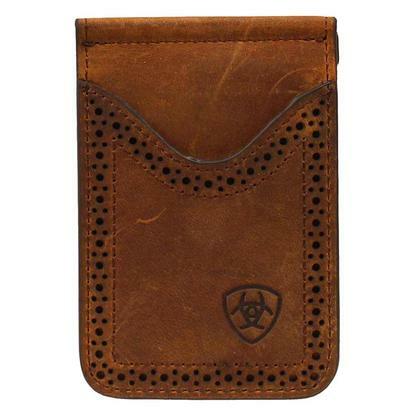 This quality wallet will keep your money safe and in style. The detailing in this clip by Montana Silversmiths are extreme from the many petaled flowers, to the jagged edges of the leaves, which is further illuminated through the precisely hand-painted black background. 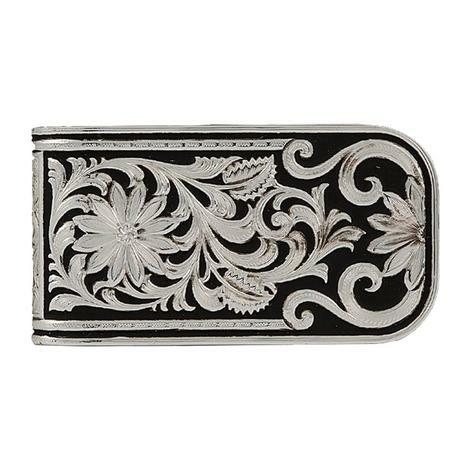 This money clip wallet by has a diamond embossed print on the outside. You can also slide cards in the outside pockets for easy access. There are also card slots, an ID slot and a cash clip on the inside. 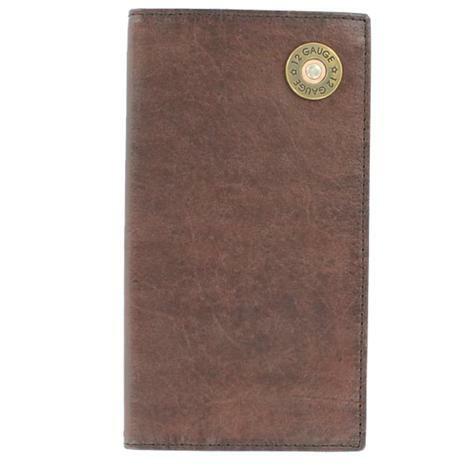 This handsome men's wallet features a 12 gauge shotgun shell on one corner and the inside has a checkbook pocket flap, billfold and multiple card slots. Made from premium brown leather. This moneyclip is perfect for keeping your credit cards and cash organized in one place. 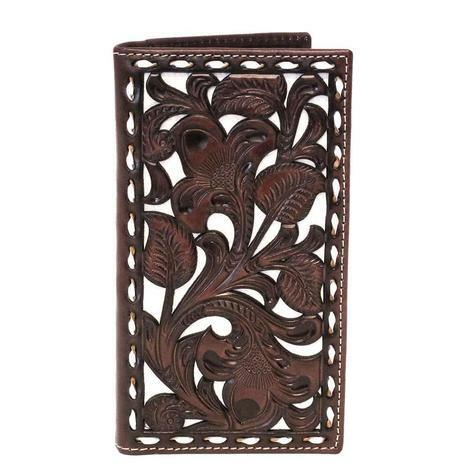 This wallet features a brown floral piercing with a chocolate underlay. The edges have an ivory buck lacing, and contrast stitching, which gives this wallet a very edgy look. 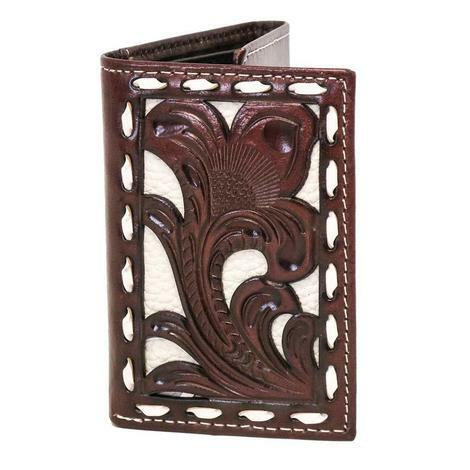 This brown rodeo wallet by Nocona has an ivory front accented with a brown tooled overlay. Inside features multi-card slots, a protective ID window, cash divider and a removable picture holder. 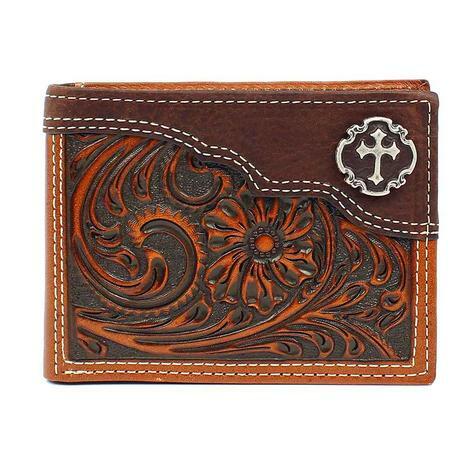 This Nocona rodeo wallet is hand tooled with floral and triple cross accents and contrasting stitching. The inside of the wallet features multiple compartments for your credit cards, cash, and an ID window. 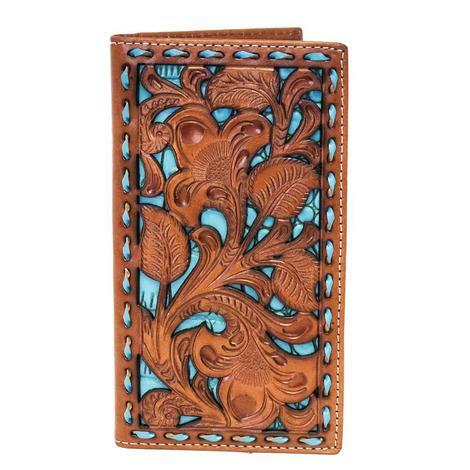 This Nocona leather rodeo wallet features a tan floral embossed piercing with a turquoise underlay. The edges have a matching turquoise buck lacing, and white contrast stitching. Inside features a clear ID slot, credit card slots, removable photo slip, checkbook and money slot. 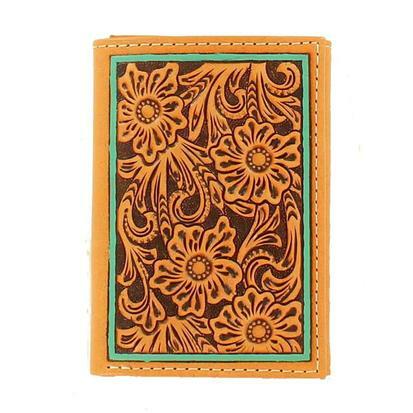 This Nocona leather bifold wallet with removable pass case features a tan floral embossed piercing with turquoise underlay. The edges have a matching turquoise buck lacing, and white contrast stitching. 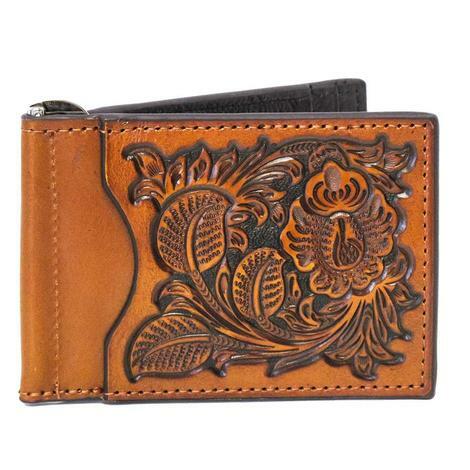 This Nocona leather bi-fold wallet features a unique floral tooled design. The inside features a clear id slot, 5 credit card slots, removable photo insert, checkbook and full length pocket for your bills. 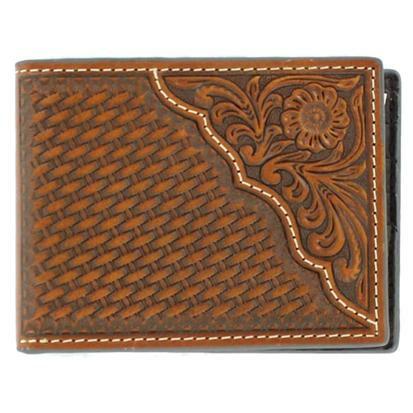 This Nocona leather rodeo wallet features a brown floral embossed design with contrast stitching around the edges. Measures 6-3/4" x 3-3/4”. 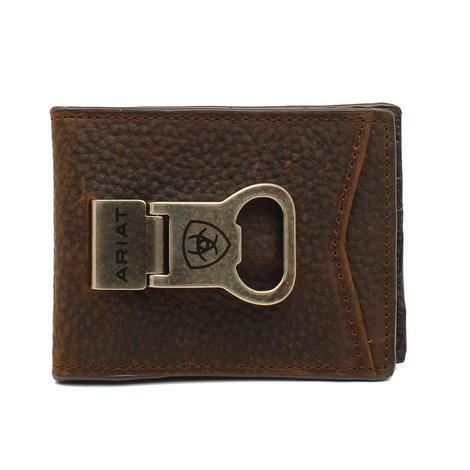 This money clip by Ariat has a perforated edge and is built to last. It can hold credit cards as well. 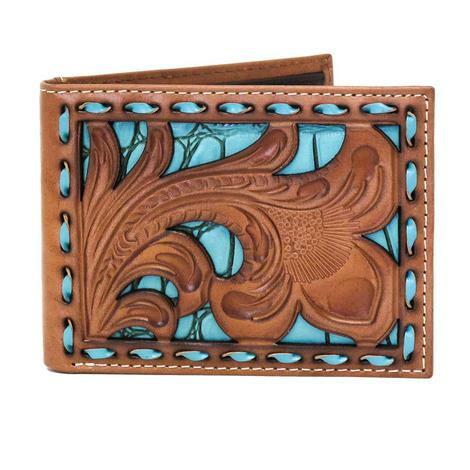 This wallet is made by Ariat using premium top grain leather and features a floral embossed pattern with turquoise edge design and heavy duty stitching. 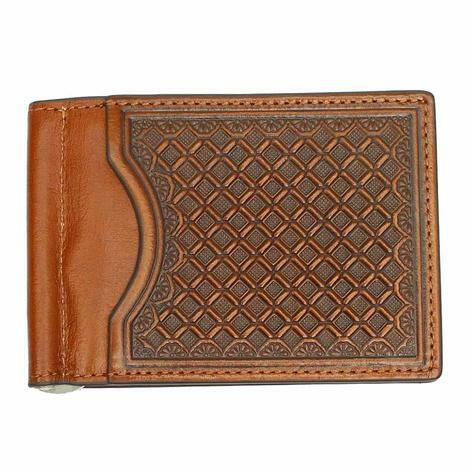 Other features include six card slots, ID window, and a cash pocket. 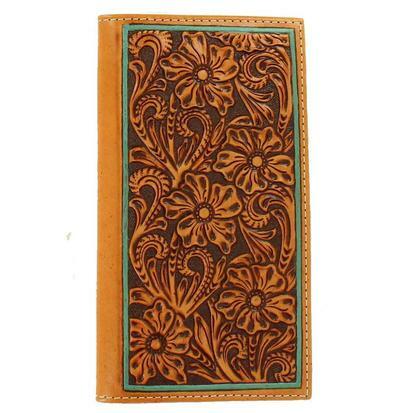 This top grain leather wallet is brown floral embossed with heavy duty stitching and a turquoise edge design. Features also include 11 card slots, ID window, room for checkbook, and cash pocket. 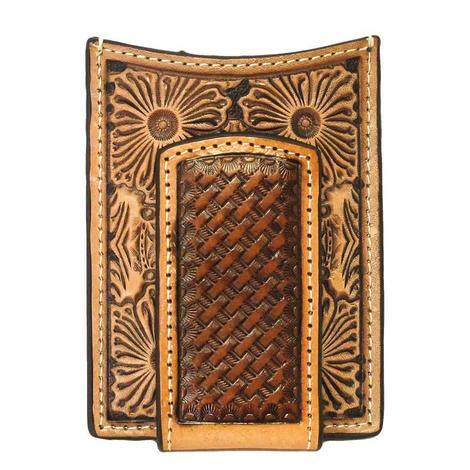 This men's leather Nocona bi-fold wallet features exquisite tooled embossed basket weave leather and a unique floral design.